Rather than just being yourself, focus on discovering and permanently bringing to the surface your best self. Don’t mistake being fearful and weak-minded for being nice. Don't fear love when it comes simply because it makes you vulnerable. But don't be surprised when it leaves, either. Just be glad you had the opportunity to experience it. 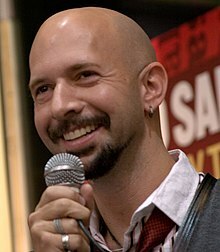 Neil Strauss (born 13 October 1973), also known by his pen names Style and Chris Powles, is an American journalist, author and ghostwriter. If you possess the ability to learn from your mistakes, then failure is literally impossible, because each rejection brings you closer to perfection. Trust is a chain that gets longer the less you pull on it. There’s no better place to hide from intimacy than in a relationship. The success of a relationship should be measured by its depth, not by its length. Unspoken expectations are premeditated resentments. Lying is about controlling someone else’s reality, hoping that what they don’t know won’t hurt you. They say love is blind, but it’s trauma that’s blind. Love sees what is. Love is not an accident. It is a delicate union of two complex, complementary puzzle pieces that have inadvertently been created by different manufacturers. A life is just one letter away from a lie. This page was last edited on 20 March 2018, at 20:59.